Cromnibus: Nancy Pelosi and Elizabeth Warren put John Boehner in tricky spot over spending bill. Nobody puts Boehner in a corner. Or everybody. Not sure. 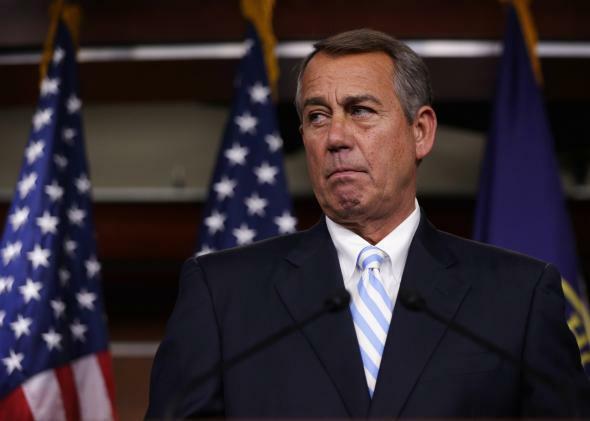 It’s been a tricky afternoon for Speaker John Boehner. The House Leadership’s bill to keep the government open (and do a ton of other stuff, some of which is highly controversial) passed an essential procedural hurdle earlier on Thursday by just one vote. Now the Speaker and his team need to ensure they have enough members on board to get the so-called CRomnibus funding bill through final passage. It’s been tough. For Heritage Action, one of House Leadership’s top conservative antagonists, it’s delightful. The CRomnibus bill has drawn staunch opposition from both ends of the political spectrum. Many House Republicans oppose it because it funds the president’s immigration move, and because members didn’t have time to read the legislation (it’s more than 1,600 pages long). Meanwhile, Sen. Elizabeth Warren has encouraged Democrats to oppose the legislation because it undoes part of the Dodd-Frank financial reform legislation. Niels Lesniewski and Humberto Sanchez of Roll Call give more details on how Warren is stepping into Sen. Ted Cruz’s territory by encouraging her House counterparts to block an entire spending bill because of a smaller component. The push even has its own hashtag, #BoehnerBankBailout. Democratic House Minority Leader Nancy Pelosi, meanwhile, sent out a Dear Colleague letter on Thursday afternoon trumpeting Democrats’ increased leverage and asking that they use it to try to remove the change to Dodd-Frank and a key change to campaign finance reform. “However you decide to vote in the end, I thank those who continue to give us leverage to improve the bill,” she wrote.